Why does a plantar plate tear occur? Plantar plate tears or plantar plate ruptures are commonly associated with flat feet, that is, a pronated or rolled in foot position. Pronation results in the 1st metatarsal bone (the right most in the picture opposite) failing to do its job properly and putting its share of weight onto the smaller bones of the lesser toes. The 1st metatarsal is the biggest and should take the lion’s share of the weight. This overloading or excessive pressure causes a thinning of the plantar plate and a deterioration in its strength over several decades. When the time comes for the tear or rupture to breach the plantar plate, sometimes it happens during a ‘big event’, like a fall or landing from a jump. Far more often though, it is a small ‘straw that broke the camel’s back’ type event, probably just an ordinary step, which results in the plantar plate tear. Pain is experienced in the ball of the foot, directly under the 2nd metatarsal head most commonly, for around two weeks as the tear heals its raw edges. It is usually less painful then for another month or two. While the pain from the tear will go fairly soon, the split will remain always in an open position from then on due to pressure from the small lumbrical muscles in the foot. It will not sit back together and it will heal in its new position. Because the plantar plate is virtually the only thing that gives transverse plane (side to side) stability of the toes, the split will allow the toe to drift sideways. In summary, plantar plate ruptures occur most often in excessive pronators, most commonly women over 40 years of age and with some increase in prevalence in those who favour high heel shoes. 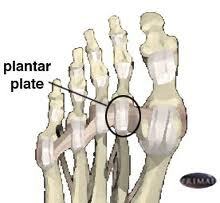 It is quite possible also to suffer a partial plantar plate tear and for the gap to remain static for years. At a future time the plantar plate may undergo another injury and split further, allowing the toe to move further sideways and even to completely cross over the big toe. Obviously this is very inconvenient for fitting footwear.